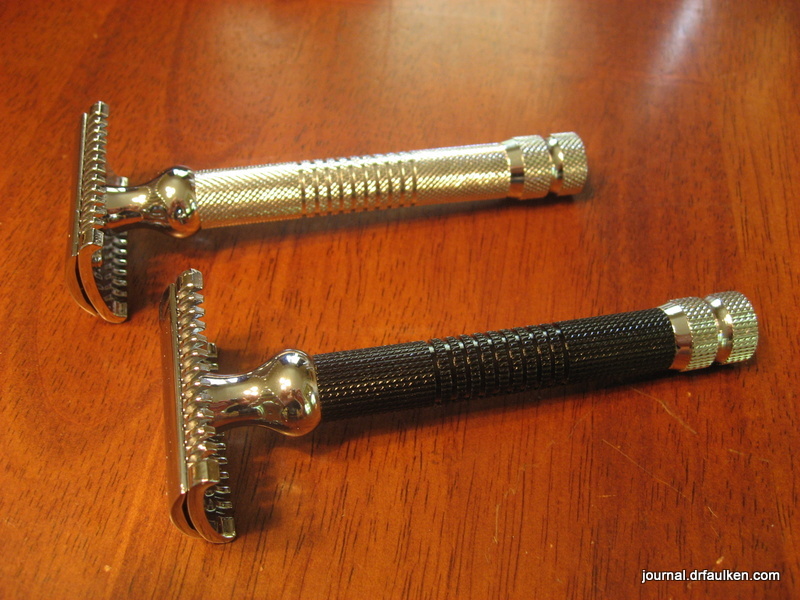 “Cadet Three Piece Open Comb TP-26 Double Edge Safety Razor.” Wow, say that three times fast. It’s a mouthful, but every word is important in describing this value-packed razor. All-brass head and body – once a common feature with razors, most modern razors are made out of lightweight metal. Brass is heavier, more durable, and more expensive than more modern components. The Lord L6 I reviewed is a good example of this: hollow body, lightweight metal, extremely inexpensive at about $13. The Cadet brass frame and head are plated. Most models have chrome heads and bodies, but some more ornate “expensive” models have exposed brass that serves as a design accent. Heavy-weight. Due to the brass construction, the Cadet razors are heavier than most of the other razors out there. The saying “let the razor do the work” is very important when shaving with a real razor, whether it be a double- or single-edge safety razor or a straight razor. Those of us who grew up on cartridge razors are used to mashing the razor into our faces to get a decent shave. That habit will turn you into a bloodletter not seen since the Aztecs got right with Huitzilopochtli. 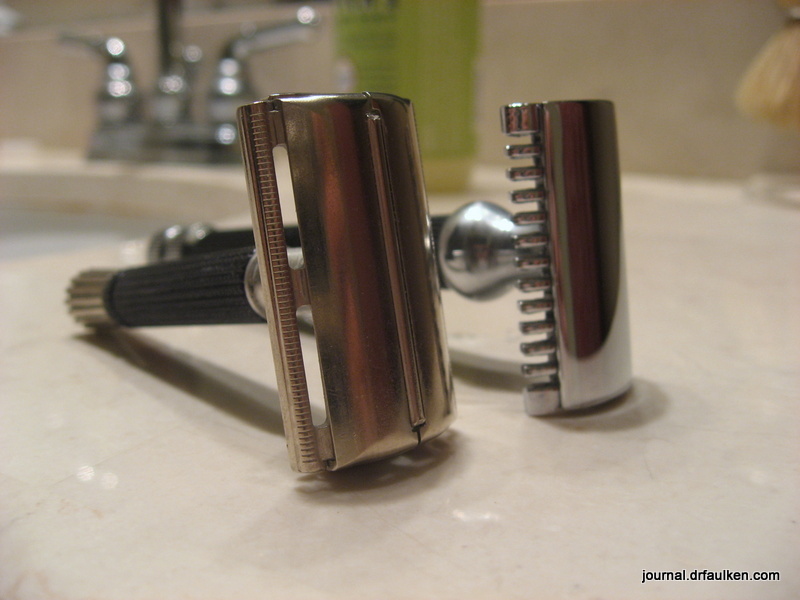 While not a kiss of death, a lighter weight razor may be difficult to control. You may inadvertently apply more pressure to the razor to get a “close shave,” and wind up getting more than what you bargained for. The Cadet TP-26 is 3.1 ounces, which is 0.7 ounces heavier than the Edwin Jagger DE86, and three times as heavy as the Lord L6. Knurled handle – while not every Cadet razor has a textured, knurled handle, most of them do. The TP-26 is no exception. This is exceptionally helpful as one’s hands get wet. A smooth handle was my main complaint about the otherwise nice Edwin Jagger DE86BL. The Cadet TP-26 always felt secure in my hand. This proved to be extremely important as I began to shave with it daily. Open comb There are three basic head designs for safety razors: open comb, safety bar, and slant. Almost all razors you can buy today are open comb or safety bar. Safety bar is the most common — there’s a little bar of metal between your face and the razor blade. This affords and extra level of protection between your skin and an OMG SHARP BLADE. On the flip side, the safety bar means you probably won’t get as close as a shave as an open comb. An open comb looks kind of like a rake, and nothing stands in the way of the razor’s super sharp edge. My Gillette SuperSpeed in the foreground with a safety bar. The Cadet TP-26 with the open comb head is in the back. Safety bar = safer shave, especially for folks with sensitive skin; open comb = closer shave, especially with folks with coarse facial hair. As I was about to find out, I had both sensitive skin and coarse hair. When I was on, I was on, and the shave was amazing. Sometimes my shave was so close I could feel my skin tingling afterwards. This is a sensation I’ve felt only after shaving my beard off. The good news was the bad news. The Cadet TP-26 allowed me to get a close shave unlike any other I’ve had before. It also empowered me to peel off great amounts of skin and cut myself magnificently. I suffered my deepest, most long-lasting cut with the TP-26 (on my upper lip) and the greatest number of cuts during one shave (eight). Thank goodness for styptic pencils. Shaving with my other razors (such as my vintage Gillette SuperSpeed) with the same prep, technique, and blade type was a less dangerous shave but yielded less awe-inspiring results. I don’t blame the TP-26 for a minute. I knew exactly when and why I cut myself, every time. Typically it was because I was in a hurry and didn’t concentrate on not applying proper pressure or technique. I learned that there are parts of my throat that require “negative” pressure on the first pass, wherein I keep the blade above the surface of my skin. Sometimes my technique just sucked. I remember twisting my neck once to get a better view of what I was doing … while I was shaving. Oops. The TP-26 is like a drill sergeant. It sees your every move. When you do well, the TP-26 says nothing. When you make a mistake, the entire world knows. Eventually I cycled away from the TP-26, picking up my SuperSpeed again. I felt that I wasn’t getting as close a shave, and went back to the Cadet. I concentrated on getting a good shave, being a good boy, shining my shoes and folding my clothes right so the drill sergeant wouldn’t yell at me and make me do pushups in the rain. This worked for a few shaves, but then I’d lose focus again and it was back to the nicks and weepers. I also learned that the more disciplined I was about shaving the less I had to worry about. It was easier to get a perfect or near-perfect shave if I shaved daily. If I skipped a day I could expect an extra nick or two. If I waited to three days … mayhem. For the record, I use Feather blades in all of my razors. They are made in Japan and are known as one of the sharpest blades. I find that using them drastically reduces the irritation of my face and number of ingrown hairs I suffer after shaving. If your skin allows it, you might be able to get by with a less sharp blade, such as Yellow #7 or Astra Stainless Steel blades. Your mileage will vary. At less than $25 before shipping, I think the Cadet TP-26 razor is an excellent value. I also think it’s the best way to get into open comb shaving if you have a hang-up about buying vintage razors, or can’t find them in your area. Open comb razors from other manufacturers can be two- to a hojillion-times more expensive. For less than $25 before shipping, the Cadet safety razors are an amazing deal. They are well made, durable, and are inexpensive enough to be an introductory razor but good enough to be a tool for the long haul. I bought mine from Shaveabuck.com, who has done most of the legwork in getting the Indian-made Cadet razors into the United States. When I bought my TP-26 there were only three or four models available, and they were frequently sold out due to their price and popularity. Now there are tons of models, ranging from the smooth-barreled to the industrial looking, to the ornate. Something for just about everyone. If I had to do it all over again (and I will, I have one in my shopping cart right now), I would buy a twist to open model with a safety bar. If you go with the open comb, just remember: take your time, and pay attention. 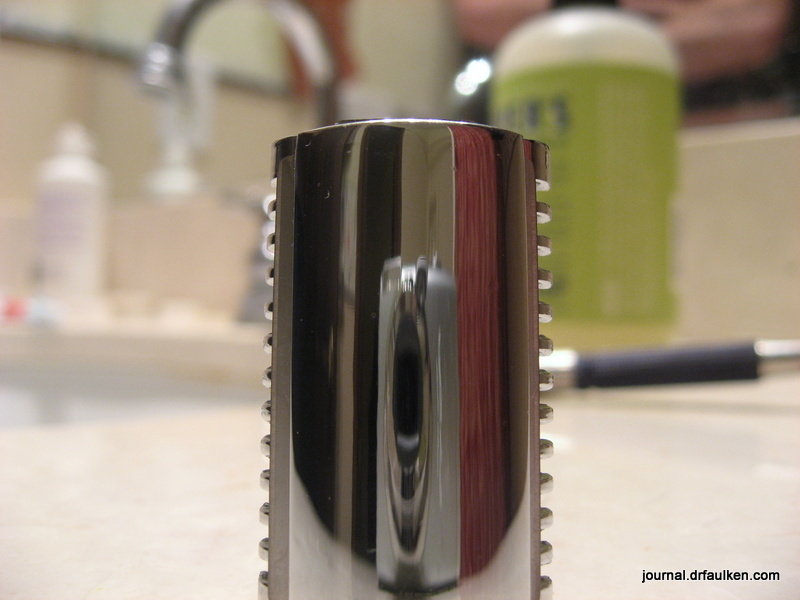 1 Comment on "Cadet Three Piece Open Comb TP-26 Double Edge Safety Razor Review"